As chiropractors, we are often educating our patients on the importance of good posture and how poor posture can lead to a musculoskeletal injury, such as a painful back or stiff neck. So its critical that we get this message across early on, and teach children how to avoid bad habits with their school bags, as this could lead to health issues later in life. So here is some advice from the team here at Shrewsbury Chiropractic Clinic. · A backpack is a good example, as it allows us to distribute the weight of the bag’s contents evenly across each shoulder, so the spine is kept straight. · But make them too heavy and this can cause children to lean forward to compensate for the heavy rucksack, in counterbalancing for the backward pull. The neck ends up in an extended position, and increased pressure is put on the hips and lower back, potentially causing pain in all of these areas. This can then lead to problems if left unchecked. · To prevent this, ensure your child’s backpack is emptied regularly, so they’re only carrying items they require on a daily basis. · Backpacks should be worn on both shoulders. 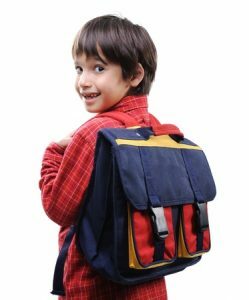 Children have a tendency to wear their backpacks slung over one shoulder, which defeats the point of a bag with two straps, as the load is significantly weighted on one side of the body, pulling the shoulder down and putting pressure on the neck and spine. · Try to pick a rucksack which has adjustable shoulder straps and hip straps. The straps should be adjusted so that the bag is held close to the back. Padding may add extra comfort when carrying a backpack. · The contents of the bag should also be distributed evenly, with the heavier items at the top so that the shoulders aren’t pulled backwards, creating discomfort and more imbalance. Please feel free to call us for more information on posture or a complimentary spinal check on (01743) 231600.